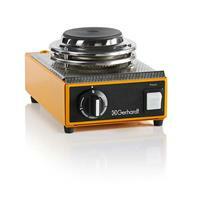 Gerhardt's Classic Laboratory Hot Plates have you covered whether you need a single hot plate or 6. Choose between the EV Laboratory Heater or Kl Flask Heater for reliable and uniform heating. Gerhardt’s traditional, compact individual hot plates and space-saving serial heating units offer reliable and uniform heating of laboratory glassware with flat or rounded bases. 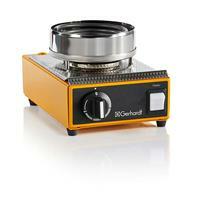 Gerhardt offers two versions of the heater. The EV Laboratory Heater is available as an individual hot plate or a serial heating unit of 6 individually controlled heaters. The EV Laboratory Heater has a plate diameter of 85 mm and can be used in many applications due to the wide range of available accessories. The KI Heater is available as an individual hot plate or a serial heating unit of 6 individually controlled heaters for round-bottomed lab glassware. 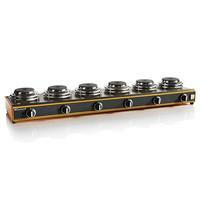 Trough-shaped tubular heating elements ensure uniform heating. This heater can be equipped for traditional digestion or distillation apparatus. A comprehensive range of accessories is available for a variety of applications, giving you remarkable versatility in one hot plate.